Committed to providing transformative, student-centered higher education, Butler University established a strategic vision—Butler 2020. University leaders knew that people were the key to cascading this vision of transformation and that attracting top talent and engaging the workforce was essential. They knew leaders would play a vital role by creating a culture of accountability and high performance, setting the tone for meeting goals, and differentiating the university from its competition. FlashPoint partnered with Butler to create Leadership 20/20, a multifaceted yearlong program designed around the researched-based program The Leadership Challenge® Workshop; we then implemented Leadership 20/20 widely, first with the executive cabinet, then to the next level down across the organization. Butler University is a nationally recognized liberal arts school located in Indianapolis, Indiana. With six academic colleges, 65 major academic fields of study, 18 master’s degree programs, and a doctor of pharmacy, Butler has over 600 employees and nearly 5,000 students. 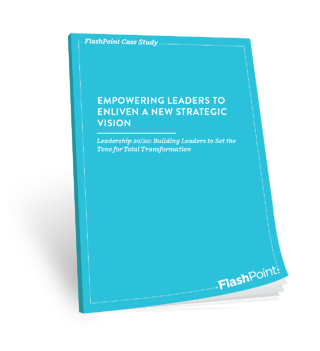 FlashPoint collaborated with Butler to enliven the new strategic vision on campus and clarify how the vision applies to each leader’s area of responsibility. 360-degree assessment: Leadership 20/20 began with the LPI®: Leadership Practices Inventory®, an assessment that measures how frequently each participant demonstrates critical leadership behaviors. Interactive workshops: Every three months FlashPoint delivered a full-day interactive workshop to build participants’ skills in the Five Practices of Exemplary Leadership®. Individual coaching sessions: Throughout the year each participant met eight times with a coach to work through current leadership issues and accountability. Development tools: FlashPoint provided participants with an individual action plan, a manager conversation guide (to involve the manager and drive deeper accountability), and a vision-cascading worksheet (to share the vision and strategic imperatives with direct reports). In post-program assessments, participants demonstrated stronger scores in 93% of critical leadership behaviors. 85% of pilot group participants increased their assessment scores in 3 of the 5 key leadership practices. 100% of participants achieved of their individual development plan goals. 4.5 on a scale of 5—across the board participants indicated that they see strong value in the program and are to apply the content directly to their current role (4.3 on a scale of 5). The group experienced a positive average observer score increase on 30 of 30 behaviors. Leaders are prepared to make more effective leadership decisions, have a stronger connection to one another, and valued learning how to clearly and effectively share strategic imperatives with their teams.